The photo id for this photograph is 701, in the Whaley Bridge L-S album. 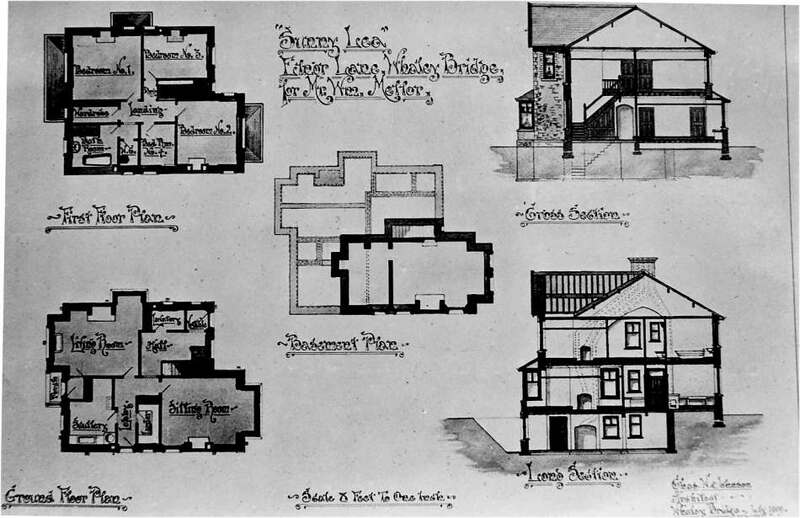 The plans for Sunnylea were very interesting as the house belonged to my Grandfather, William Mellor. For my 90th birthday my son gave me a framed copy of the architect's drawings. I would like to thank anyone involved with these great websites of Whaley Bridge where I was born. I have lived in the US. since 1948, and now I will be able to show my big family the places I knew as a girl. My Grand-daughter is a curator at the main London library, and she sent me these web-sites. Thank you for contributing to the website - your comment is so interesting. I, too, enjoy all the pictures, information and conversation about all things Whaley! It would be lovely to hear of any memories you have of people or "happenings" in Whaley Bridge when you lived there. My parents were born and brought up in Whaley, which is why I am interested in the village (they were born in 1921 and 1928) you may have known them! If you read this could you, or a relative, email this site. The email address is on the home page. I think I have found something that may interest you, but I want to check it with you first before I put it on the site.